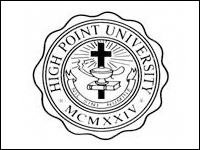 Six members of the High Point University baseball team are currently playing in collegiate summer leagues. Sophomore Nick Schumaker (Charleston W.V./Charleston Catholic) and junior Spencer Andrews (Broadway, N.C./Chatham Central) are playing together for the Kernersville Bulldogs Carolina-Virginia Collegiate League (CVCL). Dr. Tony Kemerly, chair of the Department of Exercise and Sports Science at High Point University, recently published a book, titled “Taekwondo Grappling Techniques: Hone Your Competitive Edge for Mixed Martial Arts.” The book, published by Tuttle Publishing, details taekwondo tips – beyond kicking and punching – by discovering powerful grappling moves that build on the patterns taekwondo students may already know. The publication also includes an instructional DVD. Incoming High Point University freshman Sierra Carr has a lot to be thankful for thanks to her participation in the Big Brothers Big Sisters program. 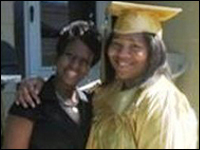 Carr, a native of Garfield Heights, Ohio, has been a part of the Big Brothers Big Sisters of Greater Cleveland since she was just 9 years old. 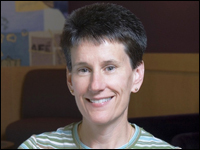 Dr. Debbie Linville, associate professor of education in the School of Education at High Point University, recently served as a roundtable leader at the 20th annual Whole Language Umbrella Literacies for All Summer Institute. The event was held on July 10 in Columbia, S.C.
Students from High Point University recently had the chance to make an impact on middle-school-aged children by presenting a special leadership seminar to 13 boys and girls at the Carson Stout Boys and Girls Club. The two-hour seminar, led by five HPU students, placed emphasis on setting moral standards and creating a personal mission statement, and allowing these two important things to drive people in the journey through life. Joyce Gomez, an incoming freshman at High Point University, was selected as this year’s recipient of the United Way’s Bob Brown Scholarship. 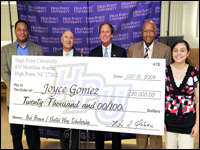 he scholarship, named in honor of Bob Brown – a distinguished trustee of HPU and a dedicated supporter of the United Way and HPU, was awarded to Gomez during a special event on July 15 at the Ward Street Boys and Girls Club. 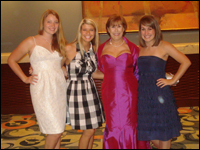 Kappa Delta sorority at High Point University has something to cheer about – the chapter was recently given prestigious awards at the Kappa Delta 2009 National Convention. The chapter received the Achievement Award and the Academic Excellence Award at the convention, held June 27 through July 1 in Orlando, Fla. Kappa Delta President Brittany Loomis, Treasurer Jean Morrow and chapter member Margaux Cote were on-hand to accept the awards. 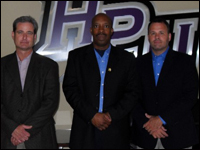 The High Point University Athletic Department has added three new members to its administrative team. 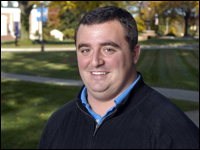 Joe Arancio joins HPU as Assistant Sports Information Director, Erika Carrubba joins the staff as Sports Information Assistant and Bryan Weigel joins HPU as Assistant Sports Marketing Director. 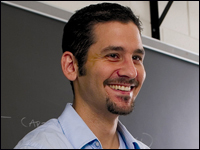 Arancio comes to High Point from the University of Michigan, where he worked for a year as Media Relations Intern. 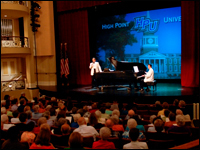 The High Point community and the High Point University family were delighted with a variety of spectacular music on July 13 thanks to a special concert from the Eastern Music Festival, which made a stop at the Hayworth Fine Arts Center on the HPU campus. More than 400 people were in attendance. The program, directed by Maestro Gerard Schwarz of the Seattle Symphony, featured notable faculty and accomplished students throughout the festival. Dr. Jane Bowser, assistant professor of education and technology coordinator in the School of Education at High Point University, was recently asked to serve on an Educational Technology Advisory Council for Pearson, a textbook publishing company. 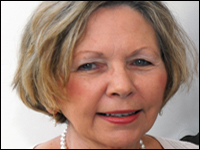 In her new role, Bowser will help review materials and formats for new Educational Technology textbooks, as well as the corresponding support Web sites. 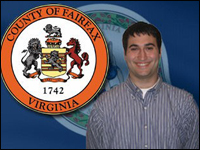 David Kaplan, a rising senior majoring in recreation management at High Point University, recently had many eye-opening experiences while interning with the Fairfax County Government in the Department of Community and Recreation Services in Virginia. Kaplan, who worked with the senior services division, took part in multiple projects during his time there. 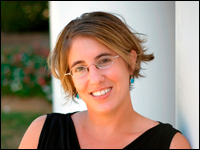 Dr. Leah Schweitzer, assistant professor of English at High Point University, recently published an article that appeared in the “Composition Forum.” The article, “Accommodating the Student Consumer,” addresses questions about what to do as education becomes more consumer-driven, as well as concerns about good pedagogy and pressures from administration to recruit and retain students. Two High Point University students – Nathan Ruffin and Marie Ventrone – are having the summer of a lifetime thanks to a prestigious internship at the Cape May Stage, one of New Jersey’s premiere professional theaters. 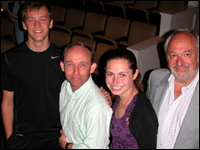 Both students, who are juniors majoring in theatre at HPU, are enrolled in the “Equity Membership Candidate” program. 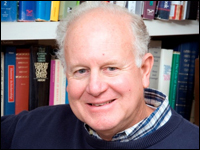 Dr. Ed Piacentino, professor of English at High Point University, recently published his latest book, titled “C. M. Haile’s ‘Pardon Jones’ Letters: Old Southwest Humor from Antebellum Louisiana.” The book, published by Louisiana State University Press, consists of the first collection of the 67 humorous dialect letters authored by Christopher Mason Haile, which were initially published in the New Orleans Times-Picayune newspaper between 1840 and 1848. High Point University student Tim Baumgartner and graduate David Reid came out on top in The Business Strategy Game’s Best-Strategy Invitational, held May 11-22. The two were named grand champions for their efforts. Baumgartner, a senior majoring in business finance, and Reid, a 2009 business administration graduate, took part in the invitation-only game. High Point University is one of just five schools in North Carolina to be included in the “Great Colleges to Work For” 2009 listings, published in The Chronicle of Higher Education. The results were announced on the publication’s Web site and in the July 10 print issue. ModernThink, LLC, a strategic human capital consulting firm, administered the survey. Joyce Gomez, an incoming freshman at High Point University, has been selected as this year’s recipient of the United Way’s Bob Brown Scholarship. The scholarship will be presented during a special event at 4 p.m. on July 15 at the Ward Street Boys and Girls Club, located at 1619 Ward Ave. in High Point. 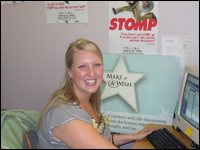 Amanda Reynolds, a senior majoring in human relations at High Point University, was granted her own wish by earning an internship opportunity with the Program Services Department at the Make-A-Wish Foundation. Reynolds works with the program team on projects whose main goal is focusing on fulfilling the foundation?s mission. Alice Sink, a retired associate professor of English at High Point University, recently published a book that contains early details of High Point College. The book, “Hidden History of the Piedmont Triad,” was launched on June 19. It includes a chapter, titled “High Point College: The Early Years (1924-1927),” and is based on research and interviews from the early 1980s with Herman Coble, the first HPC graduate, as well as Lelia Coble, N.P. Yarborough and Louise Adams. HPU Student Interns With National Center For Learning Disabilities In Washington, D.C.
Harris Walker, a rising junior at High Point University, is devoting his summer to public policy thanks to a challenging internship in Washington, D.C. Walker, who is majoring in strategic communication with a minor in political science, is working for the Public Policy division of the National Center for Learning Disabilities.